We've come a long way since the first 16 bison stepped out of the trailer in 2005. The bison herd in 2005 occupied just 80 acres of private land. Today, the bison graze 43,600 acres managed by multiple land management agencies. The bison expanded onto an additional 7,000 acres beginning December 2017. We have combined the genetics of 2 source herds to gain genetic diversity. We have exceeded the minimum population threshold for the conservation of founding genetic diversity. Our Annual Bison Report provides a summary of management goals, recent bison restoration work, and a look at what's ahead for the Reseve's bison efforts. The American Prairie Reserve bison herd is managed as lightly as possible given the current land base and Bureau of Land Management (BLM) and State of Montana requirements. While the herd technically is classified by the Montana Department of Livestock as “indigenous species managed as livestock,” we manage the animals as wildlife. The only limitation to this is fencing. We do not move animals between pastures; in fact, we have worked hard to remove fences inside their grazing area, allowing the herd to move freely on the Reserve as opposed to a more traditional rest-rotation approach. 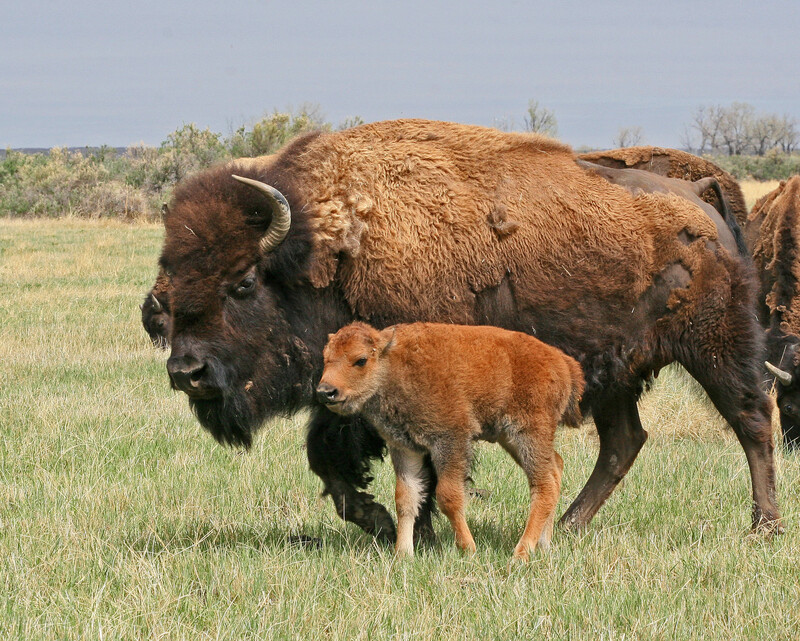 In 2005, we restored bison to northeastern Montana on American Prairie Reserve with the import of 16 animals from South Dakota’s Wind Cave National Park. The species had been driven from the landscape for more than a century. Since then, on-the-ground births and additional imports from Canada's Elk Island National Park have increased the population to more than 800 animals. This herd is now the largest in the Great Plains that is free of cattle genetics according to the latest testing technology. Our ultimate goal is a herd of at least 10,000 bison on American Prairie Reserve, making it the largest conservation herd in North America. Bison were crossbred with cattle at the turn of the 20th century in the hopes of mixing cattle domesticity with bison hardiness; of the approximately 500,000 bison alive today, fewer than 7,000 are non-hybridized. As our herd numbers increase, our focus has shifted from rapidly growing the population for the preservation of genetic diversity to increasing that genetic diversity through supplementation from different herds. All animals coming into the herd will be tested for cattle gene introgression and communicable diseases, including tuberculosis and brucellosis. By combining genetics from a range of source herds originating from the survivors of the great slaughter, we are intent on building not just the largest but also most genetically-diverse conservation herd in North America. All bison restored to American Prairie Reserve come from source herds that have been free of reportable disease since the 1970s. All animals are tested and quarantined before release. Testing up to this point has not revealed any disease presence of concern. Each winter, a portion of the herd is tested for communicable disease in order to protect our herd’s health as well as the health of our neighbors’ livestock. We also regularly observe bison for signs of problems. In addition to continued testing in the future, we have a herd disease monitoring and response plan in place. Spreading across four properties and 43,600 acres, the herd often can be hard to find while driving the sparse roads of the Reserve. GPS collars placed on lead females allow us to keep a close eye on their movements and observe their grazing patterns. To date, more than 70 miles of interior cross-fencing has been removed in order to allow the bison to graze in as natural a manner as possible. As the herd grows and we expand the land base upon which the bison graze, the animals will continue to create the heterogeneous grazing patterns on which so many other species are dependent. We follow wildlife-friendly fencing standards set by Montana Fish, Wildlife & Parks. In 2015, we began using a new wire spacing that has been shown to reduce entanglement for deer and elk and results in a 12” gap between the top two wires. In most instances, the Reserve’s fence wires are no more than 42” high and no lower than 18” off the ground. This allows elk, mule deer, and white-tailed deer to jump over, and the smooth bottom wire allows pronghorn to cross under without injury. The wire that is second from the top is electrified and powered by solar panels approximately every 8 miles and carting 7-8 kilovolts — more than sufficient to keep the bison in. Bison are allowed to roam in areas of Dry Fork, Sun Prairie, Sun Prairie North, and White Rock. These areas include where people may be present like the campground and hiking areas. Please use caution when in the presence of bison on APR property. These animals are wild and behave as such. To date, no bison-human conflicts have occurred. We work with neighboring ranches to develop a mutual understanding of our bison management goals. Want more? See a timeline of bison activities over the last 10 years and read our frequently asked questions about bison. What's Next for Bison on the Reserve? The bison herd on American Prairie Reserve is already ten years old! What does the future look like? Read more about What's Next for Bison on the Reserve? From the air, I get a better view of the bison as they spread out across an undulating and surprisingly tricky prairie landscape. Find answers to common questions about the Reserve's transfer of bison from Canada's Elk Island National Park. Earlier this week, our team headed out across the snow-covered prairie to conduct health testing and outfit some of the bison with GPS collars. Because bison herds are matriarchal, GPS tracking collars are placed on older, lead females that make decisions for the larger herd.